OK, well I’m off on holiday in a little while, so this blog will be on hold for a few weeks. Shameless Advertisement – I thank Cult Pens for giving me the ‘Birdie’ and ‘T3’. In a couple of weeks we’ll all know my opinion of them. I really wonder why a lot of writing instrument manufacturers bother with a contact link on their websites. Most of them never bother to reply to any of my questions, and from comments that others have made to me, I’m far from alone in this experience. But there is one exception to that rule, namely Staedtler. Both German HQ and their Australian subsidiary have promptly replied to my enquiries. Staedtler Australia even airmailed me their CD “Facts about Pencils” in response to a simple enquiry, and the covering note was personally signed by the CEO, so they obviously take customer relations very seriously. Where Do Pencils Come From? These 5 short movies are obviously Australian productions. There is also a “Student Workbook – Teachers Aid” section, and two bonus movies which are obviously from Staedtler Germany. One movie is about erasers, the other pencils - who would have guessed how erasers were so important in teenage love? It was good to watch the movies to see all the automated machinery producing pencils by the zillion - pencil leads and erasers just being continuously squeezed out and chopped to length. I was particularly interested to see the painting process and how they get the pin-striping and other effects. 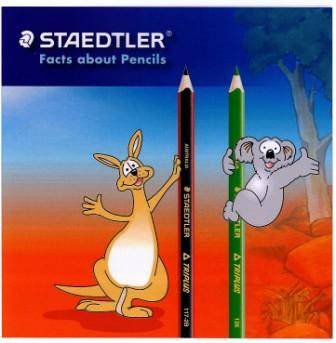 The German movie mentions that Staedtler’s two manufacturing plants in Germany produce 1.7 million pencils per day. So, 10 out of 10 for Staedtler when it comes to customer service. Note: I originally had this published over on Pencil Revolution. But since the revolution has gone underground, I thought I’d put it on my blog as well, “just in case”. The Machine Gun of Pencils? Here’s an old pamphlet, copyright 1928, Royal Pencil Corp. Unfolded it is a bit bigger than A5 size, at about 23cm high x 20cm wide (9 x 7 ¾ inches). It’s very bright and colourful. The gold printing ink still has a metallic lustre. The front page is advertising the Lodge-I-Cal Pencil. Turning to the inside of the pamphlet, this becomes a little clearer. It’s the “Salrite” pencil, and it can “…be furnished with the emblem of all Secret, Civic and Fraternal societies.” I imagine Fred Flintstone and his brothers down at the Water Buffalo Lodge used this pencil. Awesome stuff. All this from Royal Pencil Corporation, “The Machine Gun of Commerce”. Yes indeed, I’m sure that opposition salesmen cowered in the corner when they saw another rep armed with their Salrite, and what customer would dare to not write out a purchase order when threatened with such a weapon. Was this a WBD – “Weapon of Business Destruction”? On the back of the pamphlet we learn about Salrite leads, the ammunition with which sales reps will win the battle. As well as tubes of a dozen leads for ordinary patrol and skirmish missions, Salrite leads also came one gross (144) in bulk for when there was an all out major attack. For another view on Royal, if you troll around a few "ink" sites, you will sometimes find Royal on the “cheap and nasty, not worth collecting” sort of list. But hey, either way, it’s a great pamphlet. How Long Is Your Pencil? Here’s a bit of a novelty. The body is nickel or chrome plated, 7mm square in section. I think its my only square pencil, but not totally sure on that. It’s a bit of an oldie and in average condition - there is some corrosion to the plating, etc. I imagine it dates from sometime around the 1930’s. There are no makers marks or brands other than the word “GERMANY” stamped into the body by the pocket clip. The tip is a cone, and it’s a simple twist mechanism to advance the lead. There is a big long cut up the conical tip, nearly splitting it in two, and the two halves are slightly sprung and thus grip the lead. The lead is blue. Well that’s all unusual enough, but there’s more. One side of the square body is marked as a ruler, in centimetres and millimetres, 10cm long in total. The opposite side is also marked as a ruler, but this time its imperial, so 4 inches in 1/16th divisions. Yes indeed, it’s a telescopic body, extending out to a marked 25cm on the metric ruler, or 9 and ¾ inches on the imperial ruler scale. Seems a bit crazy to me they didn’t go all the way and make it 30cm or a foot long. Caran d’Ache leads were one of the surprise performers in the 2006 Lead Cup, losing to Pentel Ain in the grand final, so it’s high time they received proper recognition with a review of their own. Firstly, according to my 2006 catalogue, Caran d’Ache only offer a very limited range of thin lead refills, but just to confuse me the catalogue lists leads in two different sections, and they disagree with each other. Well, that certainly got me confused for a starter. Presumably they are in the process of scaling down their offering. Right then, I have only ever had a couple of containers of 0.5 and 0.7mm HB grade Cd’A leads, so obviously I needed to get some more of their range to do a proper review. Caran d’Ache isn’t available in my country so it was off to that world wide interweb net thing to do some shopping. Talk about easier said than done! 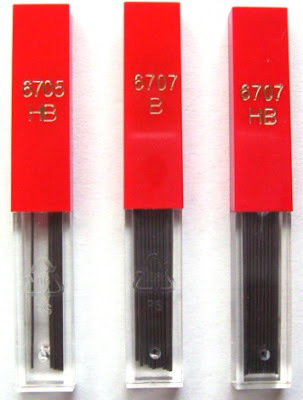 Whilst Caran d’Ache writing instruments and mechanical pencils are fairly easily to obtain online, their lead refills are another matter. Very few retailers seem to offer them, and it gets harder from there. 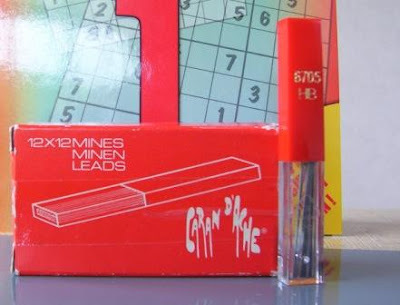 For instance I found one retailer who offered a full range of lead sizes and grades. Now this made me a little suspicious as it included many grades not in the CdA catalogue. As I was keying in my order, I suddenly realised the reference numbers were exactly the same as the reference numbers for the Pentel leads on this same retailer’s website. I didn’t complete that order! Then I found another retailer who offered a reasonable selection, but after placing my order they contacted me to say that most of the ones I had ordered were “not imported into the USA”. (This went along with my earlier theory of Cd’A reducing their range offer.) I went ahead and paid a small fortune to get the ones they did have. When the package arrived they had sent HB leads instead of the B leads which I had ordered, and was invoiced for. To make matters even worse, they had previously told me they couldn’t supply HB as it wasn’t imported into the USA, only B was!!!! Their customer services department then refused to accept they had sent me HB and so basically they’ve shafted me and that’s that. Yet another retailer to cross off my list! And yes, months later these turkeys still have all the leads that they said “are not imported into the USA” listed on their own website. Seriously, it’s just nonsense, I’ve spent seventy-five bucks and ended up with 3 containers each of 0.5mm HB, 0.7mm HB and 0.7mm B leads. Complete madness! Surely things aren’t supposed to be this hard. Enough whinging, on with the review, limited though it might be. Firstly the aesthetics. Well, Caran d’Ache don’t seem to put much importance on this aspect of their leads. The only markings on the containers are a four digit catalogue number, the hardness grade, and the recyclable plastic symbol for plastic number 6 – polystyrene. That’s it. They don’t mark their name or logo on the lead containers, they don’t have “leads” or anything on them, they don’t even say the lead diameter - you have to work it out from the four digit code, i.e. 6705 are 0.5mm and 6707 are 0.7mm leads. This really is rather surprising in todays market. Fair enough if they don’t want to make a big song and dance on the container, but to not even put their own name or logo on them…??? The lead container is a simple rectangular transparent container with an opaque red top. There are 12 sticks of 60mm long lead per container. You pull the top off and the leads are right there – no fancy ‘lead-dispenser systems’ for these guys. Don’t mix those red tops up either, otherwise your container of 0.5mm HB just turned into 0.7mm B leads. During the 2006 Lead Cup, Caran d’Ache leads had two consistently reliable winning characteristics, namely they laid down a good solid very dark line, and were very resistant to smearing. Their strength was in the “above average” category and erasability was not so good. Actually if you think about it, excellent smear resistance and poor erasability could easily go hand in hand. Load your weapons! Let’s do some writing with 0.7mm HB and B leads, compare them to each other, and to Pental Ain which I’ll take as the “test standard”. Firstly, when it comes to blackness there isn’t much difference between the two, but B is darker, as it should be. If you write a paragraph in HB, and then one in B, you can see a difference, but really it’s not all that big a difference. As I’ve said before, manufacturers could probably delete every second hardness grade and we’d never really miss them. Whilst there may not be much difference between HB and B, both being good solid dark leads, I do think they are a little darker than their Pentel Ain counterparts - again you notice it if you write a paragraph or two for comparison. When it comes to smoothness, then both HB and B are smooth, but again if you really try and compare the two, then HB is just that little harder and rougher. I did feel that in comparison Pentel Ain was a fraction smoother writing than Caran d’Ache. Excellent smear resistance was a trait of Caran d’Ache in the Lead Cup, though whether that’s a good or bad trait depends on you. For general writing, smear resistance is a good thing, but many an artist might like to blend and smear the graphite as part of their sketches. Well, when it comes to smear resistance, Caran d’Ache have got it in bucketfuls. For comparison I wrote a few words with Pentel Ain HB and Caran d’Ache B lead, and wiped my finger quickly over them. You expect a B grade lead to smear more than a HB. But no way, Caran d’Ache B lead stays put better than Ain HB. 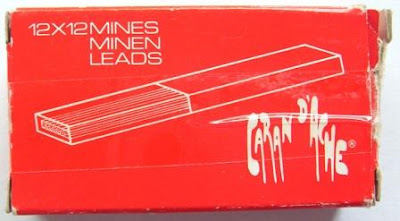 Don’t buy Caran d’Ache if you want a “good smeary lead”! 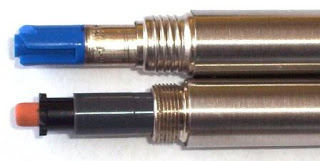 These Caran d’Ache leads are good strong break-resistant leads, but not quite as strong as Pentel Ain. Really though, I’m one of those who thinks no one should have breakage problems with 0.7mm leads, and personally I think good 0.5mm leads are plenty strong enough for most of us as well. So, overall, Caran d’Ache leads are excellent leads, but they really could do with a few more grades, and being easier to purchase! Photo: Not in the best of condition, but this is the little cardboard box that holds 12 refill containers. OK, so just testing out the new Poll feature in blogger. I picked up my Lamy 2000 for the first time in a week or so, and was once again impressed by just how good it feels "in the hand". The surface finish is great to the touch. So, do vote, I've tried to include suitable options for all opinions. Check this out over at Pencil Talk. Very interesting pencil holder, pencil extender, pencil thingy. The best of both worlds? There’s pretty much a book on everything, but when it comes to pencils we aren’t exactly spoiled for choice, even less so when it comes to mechanical pencils. One of the few pencil books is “The Pencil – A History of Design and Circumstance” by Henry Petroski (434 pages, cA5 softcover, 2004). 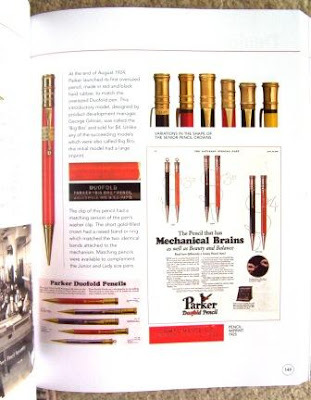 It’s an interesting read for anyone interested in pencils, although its 99% woodcase pencils and mechanicals only get the occasional minor reference. There are quite a few books on fountain pens, and since most older pens had matching pencils, these books are also worth reading. My local public library has a couple so I’ve read those. This week I splashed out and bought a copy of the relatively recently published “Parker Duofold” by David Shepherd and Dan Zazove, in collaboration with the Parker Pen Company (361 pages, A4 softcover, 2006). As expected its 99% Duofold pens, but there are a couple of dedicated pencil pages, and a few other passing references and pictures, particularly as pen pencil sets. I haven’t read the book yet, just skimmed it, but it looks good. Lots of photos, reproductions of bright colourful advertisements, etc. Very easy on the eye. A little bit of light reading for a quiet winter evening. I do actually have a new Duofold, have to get around to reviewing that after I’ve finished the book. Grrrrrrr….already I can feel the pull of the evil eBay, there must be dozens of Duofold pencils just waiting for my bid. OK, I recently received the comment reprinted below. Anonymous has left a new comment on your post "Staedtler Mars Micro 775 Mechanical Pencil Review": Retractable sleeve is usually a sliding sleeve i.e. it slides upwards during usage. This is good for normal writing. But when it is used against a ruler (or template), the sliding sleeve may be pushed upwards, exposing too much lead and causing a snap. Thus retractable sleeve is usually not the best choice for drafting works.But this is not the case for Mars Micro 775. The sleeve is unique. It is fully retractable and sliding; but once it is fully extended, it will lock into its position. It then behaves exactly like a fixed sleeve that does not slide, which is perfect for drafting works. This is a pocket safe retractable pencil with a "fixed sleeve".I think this is the reason why some strength is needed to have the sleeve "fixed" and un-"fixed".For normal writing, there is no need to fully extend the sleeve. Extending the sleeve 3/4 ways is more than enough, and the sleeve slides while you write. So, comments and thoughts please. I hadn’t really picked up on this in relation to the Mars Micro. I’ve had a very quick play with my Mars Micro. 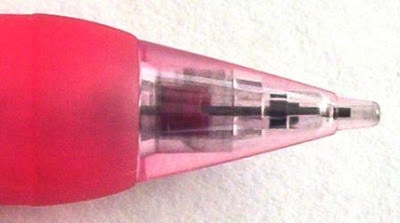 The Pentel PS315 has a different but somewhat similar sliding fixed sleeve. Anyway, just at the moment I haven’t got time to really get into this matter, so I’m throwing it out to you lot in the hope some of you will check, comment, etc. I’d ask you to put your comments on the original review rather than here on this posting. Way back in the mists of time when I was a little fellow at school, a few of the older children had graduated to a “fancy” pen, a Parker ballpoint. 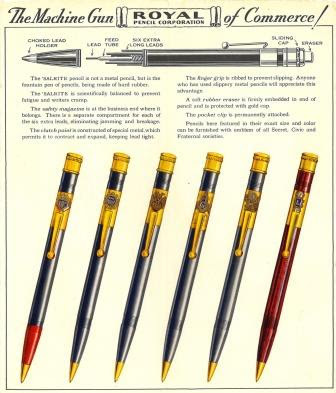 There didn’t seem to be any other choices, seemingly the only fancy pen in the world was a Parker Jotter, although it came in a few different varieties – chrome or gold trim, coloured resin or steel lower body, etc. Well that’s my memory of it all anyway. So, not surprisingly, a Parker Jotter was the very first “good” pen that I ever owned. When I was about eleven and started intermediate school, my parents thought that I had reached that stage where I should have a “decent” pen, so a Parker Jotter arrived. I also had to start wearing a school tie and a cap. A tie! Everyday, all day at school. Anyway, I remember my Jotter was a brushed all-stainless steel model. I quite liked it, but somewhere along the way it got lost. Currently I own two Parker Jotters. An older brushed stainless mechanical pencil and a new brushed stainless gold trim ballpoint. So strictly speaking this review is of an old Jotter pencil rather than a current production pencil. The Parker Jotter is a bit of a classic. It’s been around for a long time, and has those long clean smooth classic tapering lines. It looks a plain, simple, no-nonsense but classy sort of writing instrument. It seems to me you normally see the Jotter pencil as part of a ballpoint pen and pencil set, rather than as an individual item. The Jotter is a standard push top ratchet mechanism pencil, but rather unusually there isn’t an eraser under the top cap. Instead, if you unscrew the top half of the body there is a small eraser there, plugging the top of the lead refill magazine. The screw thread on my old pencil is a fine machine cut thread, but on my new ballpoint the thread is a coarse rolled thread. I’m sure cost reductions were achieved by this change. But the rolled thread still works OK, and possibly its even better for those folk who seem to have a little trouble starting fine threads and end up cross-threading the damn things! The body is different too. The pencil is much heavier and feels like the wall section is thicker than on my much lighter new ballpoint. Actually the ballpoint feels so light that in comparison you would think it was made from aluminium. But having said all this, neither Jotter is a heavyweight. Also the style of the end cap has changed – the old cap had a depressed centre, and the new one is a simpler flat topped pressing. 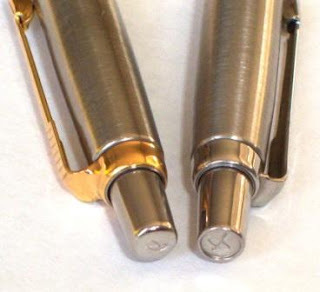 The mechanism on the Jotter is a good positive clicker, with 10 clicks advancing 6mm of lead. I believe it’s only available in 0.5mm lead, which is a little unusual in these days of 0.7mm popularity. The tip is a short cone with a short fixed sleeve about 2mm long. Fine for writing and ruling an occasional line, but there’s no pocket safety here. Also I find the tip looks a bit incongruous. It really breaks the smooth continuous lines of the body. I don’t like it, and I’m sure they could have done something better. The pocket clip is a good reliable steel clip, and of course it has the trademark arrow design. The clip and top button trims are polished, whereas the body is brushed. As well as providing contrast with the trims, the brushed effect gives you a little something on the grip front, but on a hot humid day, the brushed effect won’t really help much and things might well get a little slippery. With the long tapering body you can grip the pencil anywhere you like, but it’s a fairly narrow body so not really for those who like a “fat” grip. “PARKER” and “Made in USA” are discretely stamped into the body. Overall, this is a good pencil, and I like it, but for pure functionality its not too hard to do better. Best Points – Classic solid steel. Not So Good Points – Tip not retractable. Dimensions – Length 133mm, diameter about 7 - 8mm in the common grip area, 10mm at the widest point. Balance point about 70mm up from the tip. Sorry about some of these photos not being the best – its actually quite hard taking close ups of a shiny reflective metal object with just a basic camera. Recently my attempts to obtain some Koh-i-noor leads ended in disappointment and an invitation to buy some snake protective clothing?! Well, they’ve upped the ante on me now. These guys are great. I buy a pencil from them, and a few weeks later a big brand new 2007-2008 full colour, A4 size, 728 page catalogue arrives. Totally unasked for. Posted to me all the way from the USA. Talk about chasing my business, and global warming get stuffed. “Beaver & Otter Trapping Techniques”, softcover, 114 pages. Awesome. Unfortunately, (a) similarly to snakes, we don’t have any beavers, otters or other such similar things here in NZ; and (b) never seen one, but I think I’d like beavers and otters and don’t really want to trap them. But hey, I’m sure this booklet is full of really interesting practical stuff, and if I’m ever lost in the Canadian wilderness and really really hungry, then I’ll be damn glad I read this booklet. 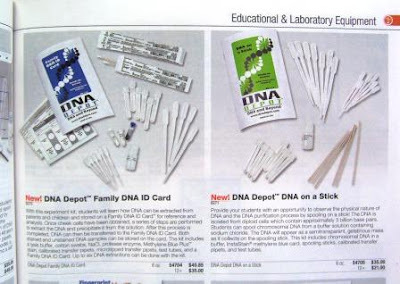 “DNA Depot Family DNA ID Card” – an experimental test kit to take and analyse DNA from your family and produce the family DNA tree. Umm, not really sure why a forestry company would be selling this, but just imagine the possibilities… “Hey Mum, how come my DNA looks like yours but doesn’t look anything like Dads?” My mind just boggles. Think of all the lawsuits for “emotional torment” from incorrect test results, let alone the lawsuits from the correct test results! This test kit is just mayhem and mischief packaged up in a box! It’s almost enough to make me take up a career in the forestry industry just so I can legitimately shop with these guys. Right-o, here we have snippet number three from my “Japanese Sampler”, the Uni Return’s M5-318 0.5mm mechanical pencil by Mitsubishi Pencil. So thanks again to my friend from Japan for sending these. 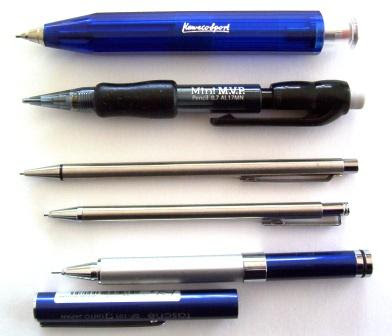 It’s a relatively lightweight all-plastic pencil, although its internals are mostly metal. I quite like the look and rose pick colour scheme of my particular pencil, but the rubber grip really spoils things for me. The rubber grip is a cheap looking translucent matt finish that just doesn’t go with the glossy transparent remainder of the pencil. Also its one of those useless rubber grips that is hard and not really all that “grippy”. Why bother? When I first open my Japanese Sampler package and had a quick play with all the pencils, I was a little disappointed that one of them was broken. It was this one, the Uni Return’s. You see, it wouldn’t advance the lead. I tried feeding new lead in, both from the magazine and through the tip, I pulled it apart several times, and so on. But it was just erratic, sometimes it advanced lead, sometimes it didn’t and sometimes it…and then it started to dawn on me. Things suddenly became clear. They didn’t call it Uni Return’s for nothing. So, this is a seemingly normal push top ratchet lead advance mechanism, but really it’s not. If you push down lightly on the top of the pencil lead is advanced, BUT, if you push down hard the lead is retracted, i.e. returned. Well, hands up, I surrender, you got me, I’ve never seen or heard of this before. There's sort of an extra little collar piece inside the tip mechanism, and when you push down hard it is pushed forward to grip the lead stick and then drag it back when you release the pressure. I imagine if I could read Japanese the writing on the little stickers on the pencil would have alerted me to this double function, but I don’t, so they didn’t. Though intrigued, and in awe at the creative concept and engineering process that put this mechanism together, I am ultimately not a fan of the Return’s. You see, it’s easy to push too hard, to retract the lead when you really wanted to advance it. Particularly when I was at work and in a bit of a hurry, or some fool had just irritated me and my pencil was bearing the brunt of my frustration, I’d be pressing down hard on that pencil and no damn lead was coming out. You know they even have it worked out so that one "return" click will retract about 4 or 5 lengths of "advance" clicks. Basically one return click will always retract the whole lead even if you have over-advanced it a couple of times. Good thinking. So, hey, good on you Mitsubishi Pencil, fascinating idea, just doesn’t quite work in the real world. Well at least in my world anyway.